Hypertext, e-mail, word processing: electronic technologies have revolutionized textual practices. How does language on screen work differently from language on the page? What new literacy skills are needed and how do we teach them? Page to Screen collects some of the best contemporary thinkers in the field of technology and literacy. They analyze the potential of the new forms of text, the increased emphasis on visual communication, new forms of rhetoric, learning in the age of global communication networks and new approaches to storytelling. 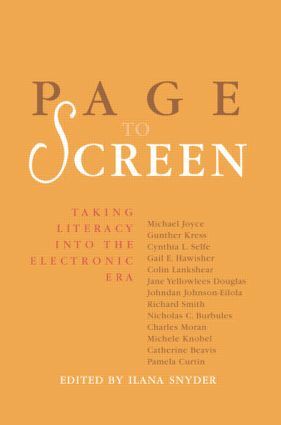 Page to Screen is compelling reading for anyone interested in Literacy Education, Language Studies, English, Library Studies, Multimedia and Communication Studies. International contributors include Gunther Kress, Cynthia Selfe, Gail E. Hawisher and Colin Lankshear.